Exciting rail news! Britain's Network Rail announces plans for 38bil (in British pounds) investment. New routes, new stations, old routes reopened....and under a conservative government no less. Bad rail news. The plans of New Jersey's governor to kill new rail tunnels under the Hudson remain in place...as he stands watch over G.W. Bridge madness...Florida governor, 'Mr. Pay Almost a Billion Dollars in Fines' for cheating done by his healthcare company, has killed high speed rail dead as a doorknob...Amtrak is killing flowers in its dining cars to satisfy Congressional bean counters....and the union hating, nutty comment governor of Maine has thrown himself into blocking well researched and vetted plans to build a facility in Brunswick, Maine, which would open up the possibility of popular Downeaster service to many other parts of the state. Oh, and politicizing planning to an unheard of degree. What's wrong with this picture? Why in the face of backed up highways, dire warnings about air pollution, and the growing success of Amtrak are these pols so intent on showing a disdain for major public investment in rail infrastructure THAT THE PUBLIC WANTS????. Sure, the governors of California and Massachusetts are proving an exception, and Obama speaks a good line and has held the Amtrak fort, but good heavens, removing flowers from dining cars. Yes, and wine tastings for first class passengers as well. Soon we'll have to build Harvey Houses to feed rail travelers....Aha, profit to be made there. And back to the 19th century where many of these characters belong. Its been a quiet few weeks on the rail photography front. Too many things on the personal agenda, but on an early September (2014) trip did get over to the Berkeley, California, station for an hour or so in the late afternoon. If luck comes in little packages I had a good day. 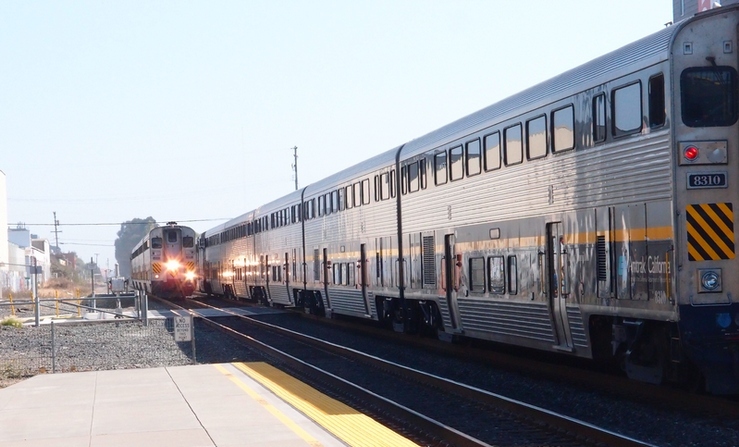 Shortly after catching two California Corridor trains passing each other on their way in and out of the station, the California Zephyr came roaring through. Get this, the CZ was only one minute (repeat "one minute") late on this trip from Chicago to Emeryville. The Union Pacific must be smoking good stuff these days, and it was fun the see a gleaming train that was doubtless full. Of course, given the idiocy of our Congress it will be interesting to see how passengers fill their stomachs in the years ahead. Enjoy while you can. Or start a dining car biz. . It's going to be a late autumn in Central Massachusetts in 2015. But autumn there will be! 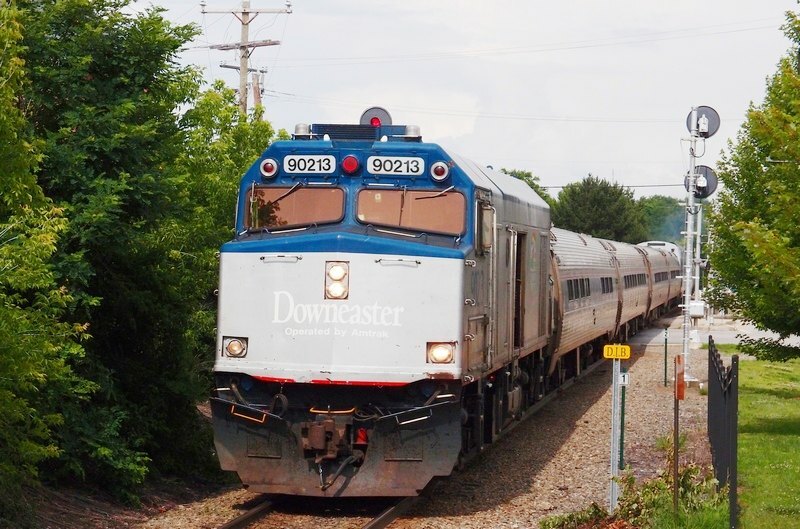 Here, from October a year ago, is the Boston section of the Lake Shore Limited cruising along the shores of Mill Pond in Westborough, Massachusetts. You won't be seeing more photos from this spot. Mill Pond is filled with stumps, visible above and below the water, it once being a reclamation area. One of the hidden ones did a good job on my trusty canoe so there has been lots of patching and cursing. I would much rather be in the lounge care looking out, but one can't have everything. Sorry I have not been posting recently....just too many things going on and virtually all rail travel has been over sites amply photographed for FOA. 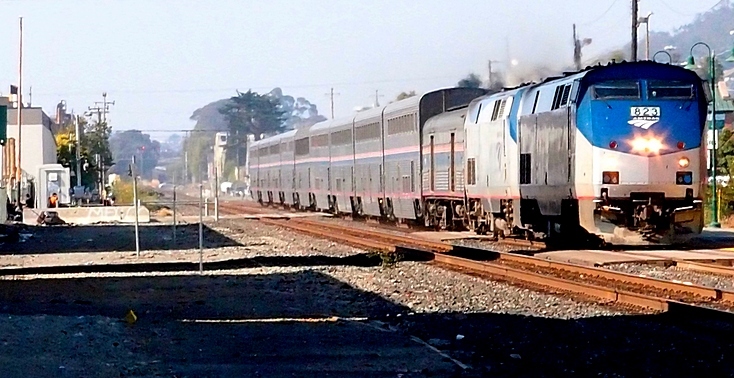 It is absolutely necessary that readers keep an eye on the idiots in our Congress who have gone to war against Amtrak amenities as a way of killing service. The second photo here was taken two weeks ago on the California Zephyr, from which the bean counters have removed flowers, both real and artificial. Apparently they are not contributing to profitability targets which, within five years, could kill all food service on long distance trains...meaning that most long distance trains will be killed. There is lunacy afoot and perhaps the only good news is that Amtrak is a canary in the coal mine. When I told our server I missed the flowers I got a quick and fun result on my placemat. But not much to laugh about folks. Cameras; Olympus E-510 and XZ-1. Shot by Friends of Amtrak photographer Ron Goodenow with an Olympus D560 camera at the railroad station in Wells, Maine in January 2006. Changes last made on: December 14, 2015.